Wrongest Product Award nominees can crop up when you least expect them. Or perhaps that’s the only time they appear. 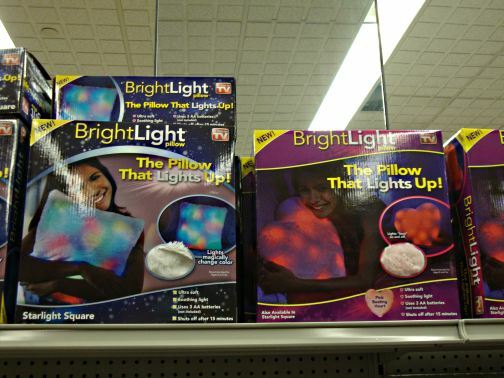 In this case, I stumbled upon the BrightLight pillow (batteries not included) while on line in a CVS during Superstorm Sandy. “Useless,” I thought, but then realized it was perhaps exactly what I needed for my semi-refugee status. It could serve as both pillow and emergency light. Assuming, of course, that the store hadn’t run out of batteries. This entry was posted in Wrongest Product Awards and tagged Superstorm Sandy on November 5, 2012 by David Bergman.